“Thank you so much Paul for everything that you’ve done for us. Ruben went above and beyond my expectations and made the experience pleasant as possible. I will highly recommend him. Ruben was always extremely responsive and understanding of what we were looking for. We never felt pressured to make a hasty decision. As first-time home-buyers, we really valued his input on navigating through the home buying process from start to close. Paul was wonderful to work with in the selling process. He provides expert knowledge of the market and understands how to sell homes quickly. Our house was under contract in just 2 days! Paul is easy to contact and works around the clock, making you feel like his first priority. I would highly recommend him as an agent! 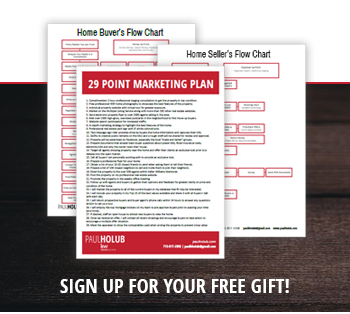 Paul Holub helped me buy on both sides of my home experiences. The selling of my first house, where he was able to get me several 10’s of thousands of dollars more than I thought I would be able to get, followed by a hand held process to buy my new home which was double to the size. Not only did he help me with that, but he has also made sure that all parties involved in my home buying process were in sync. It is hard for an A personality like myself to be patient with the processes but somehow, Paul was able to ensure that my questions were answered in a fair amount of time and that the ball continued to move in the right direction during the three month span. Paul Holub, friend and associate, has my recommendation! Paul Holub gets the job done!! He takes pride in what he does and most importantly he is 100% all about making sure his clients are taken care of and happy! He is very quick at responding to emails, texts, and phone calls! I am forever grateful I chose Paul to help me sell my old home and find my new dream home… I am one happy and satisfied client!!! No matter how bleak the situation seems or looks Paul was there to save the day. As stressful, weird, and cruel buying a house in Houston can be, this is the guy you want. When navigating through all the BS, even when dealing with the seller’s shady agent, this is the guy you want in your corner. My experience was so good, I might even consider moving again just so I can use Paul’s services again. When in doubt, don’t doubt. Just call Paul.